 Recently I conducted a little bit of market research within the wargaming community. Just a small amount, so this is by no means definitive (still had a larger number of people responding than your average toothpaste or hair dye advert that claims it’s UK number 1! 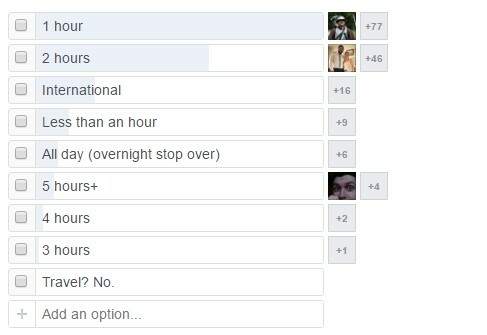 ), but the results I obtained were pretty conclusive. 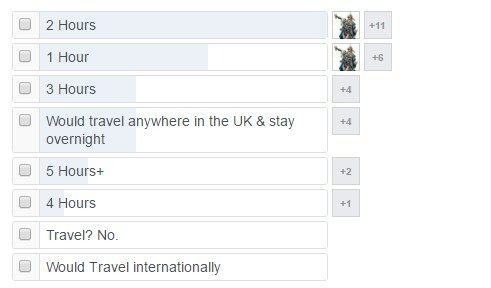 The Question asked was posed to 5 UK based gaming groups on facebook, to see how far people in the UK would be willing to travel for a gaming tournament. 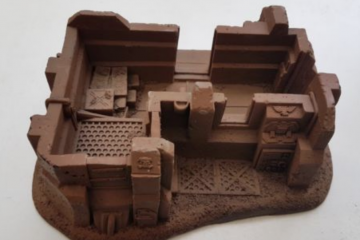 The reason for asking this question is that I’m part of a gaming group in Cumbria, who’ve been running gaming events for a while now, and we’re looking to attract people from further afield to play in our events. Whenever we hold an event, I share it in the relevant groups as often as possible without being annoying, so far, we have had very very little uptake from outside the county. 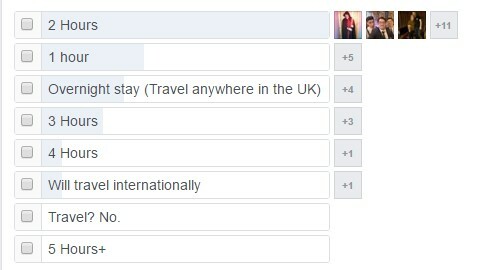 This was the main reason for asking the question, and the results that I got were, well. Disappointing to say the least. 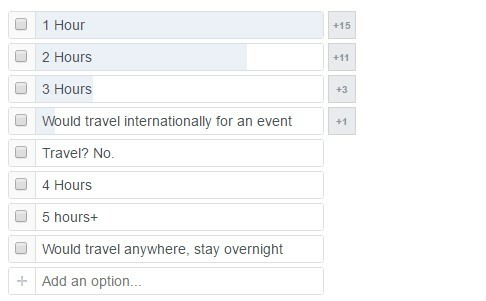 So there was a pretty clear result for this question, 131 people were prepared to travel 2 hours for an all day event, and 130 were only prepared to travel for an hour. So out of the 5 largest populated cities closest to Workington, only one of them falls within the 2 hours people are willing to travel. Personally, I’ve traveled from Cumbria (and Northumberland when I lived there) all over the UK, having been to events in London as well as frequent trips to Nottingham, Sheffield, Leeds, Manchester & a whole lot of others too! Living in Cumbria, you have to travel to do pretty much anything, we’re literally surrounded in mountains and lakes on all sides, coupled with the fact we only have one motorway in the entire County (M6), travel is often slow. I commute 33 miles to work, which usually takes around 45-50 minutes by car. I’ve never been adverse to travel, either by public transport or driving. Usually I’d rather have the experience of having done it, than not to bother because it requires some effort, so it was a particularly hard barb to swallow when I found out that the rest of the UK doesn’t share my same views. Whenever we hold events, I always make a point to make sure that the cost of entry is low, and the prizes are worthwhile. We always try to make the prizes go as far down the table as possible. I’ve been to a few events that have been “winner take all”, or, 1st & 2nd place get amazing prizes but 3rd+ gets nothing. To me, it’s never been about the prizes. I don’t play to win. Law of averages says if you do, majority of the time you’ll be pretty disappointed. I much prefer to have some great games and enjoy myself than win at all costs. That being said, it’s always nice to win something, especially when it’s worth more than the ticket price to get in the event. 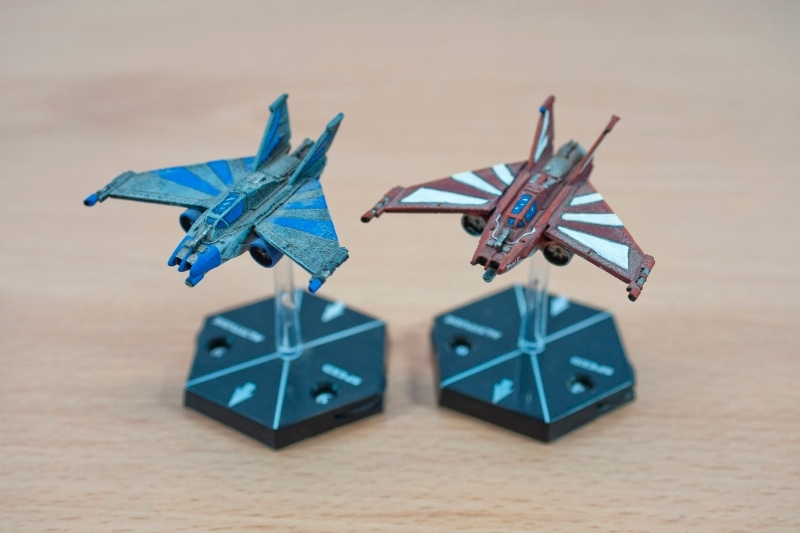 When we hold X-wing events, the club subsidies the prize pool on each event & the entry fee goes into prizes. The more people turn up, the more prizes we can give out. The prizes come from a local retailer who offers us a discount when purchasing prizes so it works out great for everyone. The retailer gets a sale, The club gets new players and the players get ships as prizes. Our Batman events, which have been the most successful at bringing in people from outside the county have also used sponsorship as a way to boost prize support. The retailer donates a prize, and their advert/links are shared along side the advertising for the events, they get exposure & cheap advertising, The event has better prizes, which means the players get a lot of prizes for a low cost of entry. It’s works to everyone’s benefit & has made sure that our events, although small, have excellent value for money, which I was hoping would help draw in the crowd. Unfortunately, it doesn’t look like prize support & low cost of entry is enough to entice people to travel. On the other hand, high cost of entry, and low prize support is a sure fire way to put people off. So in that respect, at least we aren’t doing that. This leaves West Coast Gamers with a problem when we wish to hold events in West Cumbria. 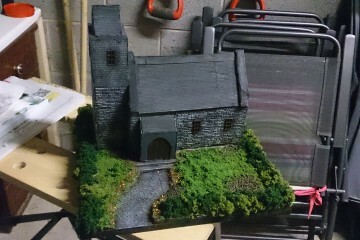 Earlier in the Year we organised an event Phoenix – Lakeland wargames exhibition which was held in Penrith, it was very successful and is looking to be just as successful, if not more so when it returns next year. Penrith is a LOT easier to get to than Workington, from any direction it cuts 45 minutes from the traveling time. That means its roughly 1hr 35 from Manchester, 1hr 15 from Glasgow, 1hr from Newcastle and 1hr 50 from Leeds. This puts a lot of the major cities in the north within that magic 2 hour window. It’s still more than an hour, But realistically, with where we are located there’s nothing I can physically do for those people. So when planning future events, if I wish to get people from outside the county to come, we would have to hold the event in either Carlisle or Penrith. This will be difficult, as we don’t have very good links with venues in these two places. it’d add a whole extra level of complexity on the off chance that some people might come. It would also add to the cost. We get good rates at our venues because we hire them weekly, sometimes even more than once a week. Hiring a venue for a “one off” event would put the price up, this would eat into the “value” for the players, but, if more turned up, it could even out. It also means that a lot of players locally from the Workington area who only have to travel for a few minutes would have to travel for nearly an hour to get to the event. 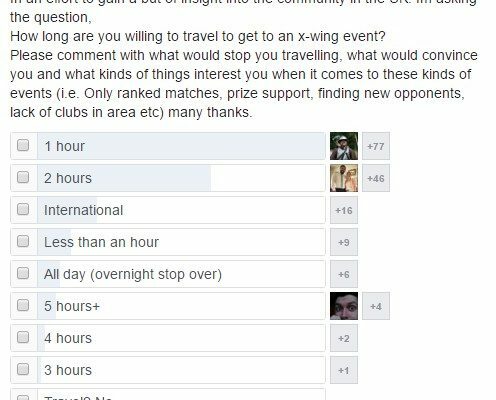 While this sits in the 2nd most common box ticked on the poll, it probably won’t go down too well to make people travel for nearly an hour to play an event that used to be just up the road. This is a real predicament that our club is going to have to think about if we want to get people to come into our county to play.